Have I ever told you about my LOVE/HATE relationship with S’mores? While I love eating a delicious S’mores, I am much happier making these Indoor S’mores. 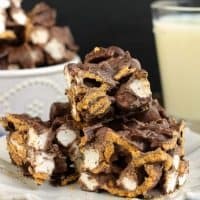 No Bake S’mores Bars! I don’t know who in their right mind thought of this campfire activity. 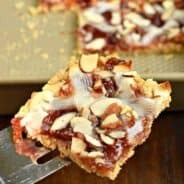 Let’s gather our overtired children (you see they have been playing outdoors and swimming all day at the campground) and make a treat near a large open fire. Oh, and let’s put the marshmallows (aka white goo that sticks in the hair, face, clothes, and anything else that comes within 2 feet of it) on a stick and put those sticks in the open fire (while repeating endlessly, “step back you’re too close“). And, while roasting these sticks of super glue marshmallows over the fire, let’s teach our children to be patient enough to roast them to the perfect golden brown. These same children who don’t have the patience to wait outside the bathroom door for me while I am trying to take just a minute…the same children who ask within 5 minutes of being in the car “Are we there yet“, the list goes on! You get the point. Ugh. You finally end up roasting all the marshmallows and make beautiful s’mores for everyone, only to throw it all in the trash because while you were painstakingly turning the marshmallows until they became golden brown, your children have now eaten three chocolate bars, ten marshmallows, and all the graham crackers have fallen on the ground. Plus they just aren’t hungry. Oh, but they are on a sugar high. Right before bed! Which brings me to these treats. Easily made any time of the day, preferably around noon. Eat them by a sprinkler, cleanup is a breeze! No fire necessary. Now, sitting around the campfire you can do the fun things….sing songs, hold hands, look at the stars…. Let’s talk about these No Bake treats. Line an 8-inch square baking dish with parchment paper. PRO TIP: Use binder clips (or clothespins) to secure the parchment to the side of the pan. This keeps the parchment paper in place. In a large mixing bowl, add the Golden Grahams cereal and marshmallows. Set aside. In a medium glass bowl, add Ghirardelli dark chocolate melting wafers. You can also substitute chocolate bark (Candiquik) if you’d like, but I love the taste of the Ghirardelli. Heat melting wafers for one minute in microwave, stir and heat an additional 15-30 seconds. Stir until smooth. Pour over cereal and marshmallows and mix until fully coated. Spoon mixture into baking dish, pressing down gently with the back of the spoon. Refrigerate for 15 minutes. Remove from pan and cut into squares. ENJOY. Store in airtight container at room temperature. If it’s too warm, pop in refrigerator to keep the chocolate from melting. Making Indoor S’mores is nothing new really. 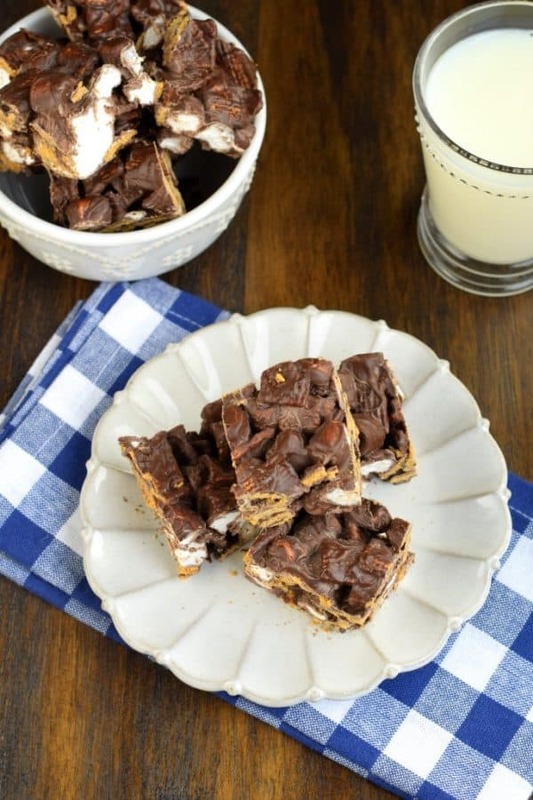 These S’more Cookie Bars are a delicious gooey treat that doesn’t involve a campfire! Now, if you want something even faster, this S’mores dip is ready in MINUTES. And it takes just a couple minutes to gobble it up too. I’ve got 50+ Ways to Enjoy S’mores without a campfire. Surely there is something listed that YOU will love! If you’ve ever made Muddy Buddies or Puppy Chow you know how great they taste, and how easy they are to make. Now, imagine Puppy Chow Bars. My mind is blown. 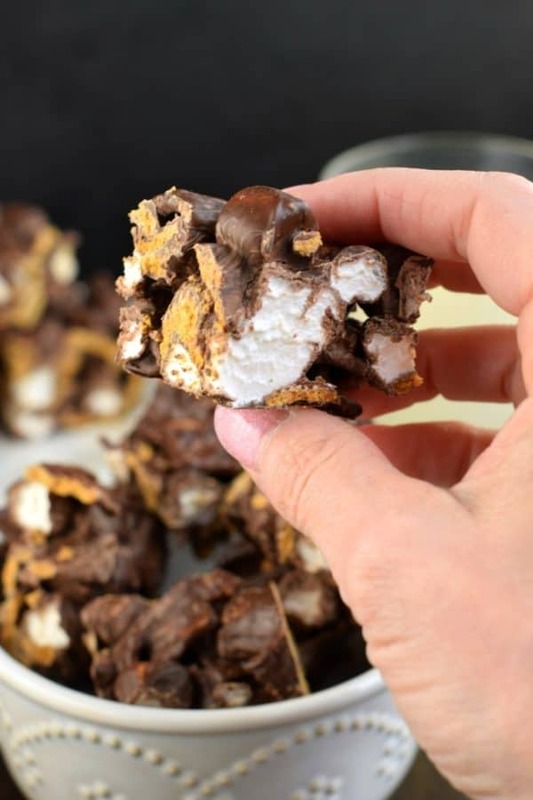 Indoor Smores made with Cereal, marshmallows, and chocolate. In a medium glass bowl, add Ghirardelli dark chocolate melting wafers. You can also substitute chocolate bark (Candiquik) if you'd like, but I love the taste of the Ghirardelli. Store in airtight container at room temperature. If it's too warm, pop in refrigerator to keep the chocolate from melting. Recipe originally published April 18, 2011. Photos updated April 2019. These look so good! My sister LOVES s’mores, but we are not big campers and rarely have a chance to make them. These will be perfect to satisfy those sudden s’more cravings. I just found your blog and am your newest follower! These smores look amazing! Thanks for creating such a fab blog full of inspiration. Your description of s’mores is hilarious! These look like a fun indoor alternative! Adorable Idea!! Just saw you on the Mom’s Crazy Cooking Hop! Stop on over at my blog and link up this tasty recipe in my Easter/Spring Recipe/Idea Hop! If you have others, feel free to link up! I’ll keep it going for a few months so you should get some visits from it!!! I’m following your blog with google friend connect now!! I loved reading your post, so funny. Your s’mores look good enough to have some more of them. Thanks for linking this up to Sweets for a Saturday. 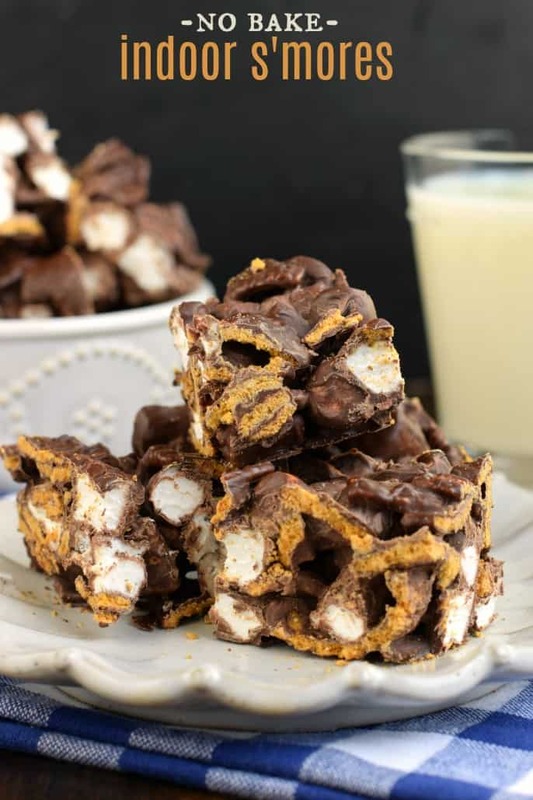 Thanks for finally writing about >Indoor S’mores – Shugary Sweets <Liked it! 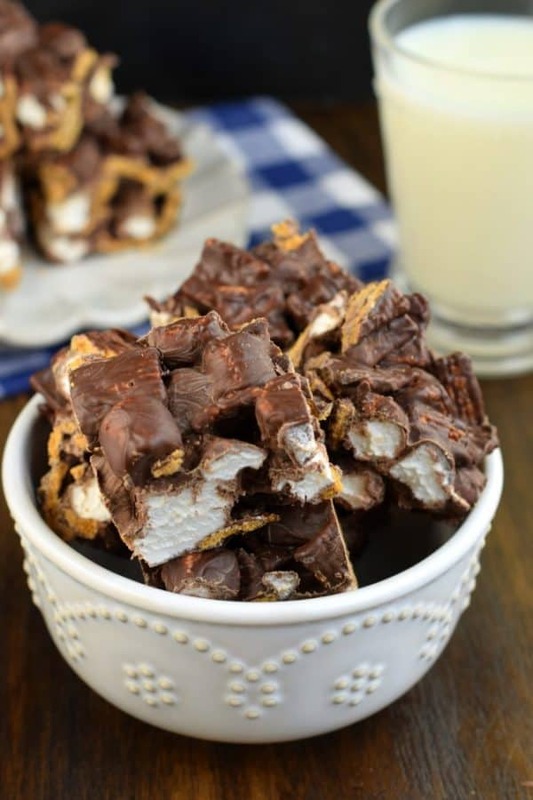 These smores are so fun for summer – my kids loved them! 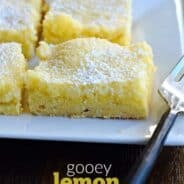 Oh my, I love how easy and delicious these are!! My kids around going to LOVE them!! These are perfect for those chilly evenings! My family loves these!! 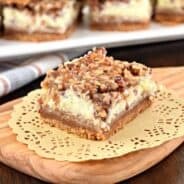 such an easy dessert any time! My fave! cant wait to try these.